Last week, images started surfacing of Salsa’s Warbird gravel racer. Now the 2013 collection has been announced. Salsa made aesthetic and geometry changes to many bikes, but also have a few brand new rigs. To start off, Salsa is unveiling the aluminum Beargrease fatbike and a new ultralight Beargrease tapered aluminum fork to match. The frame is said to be super stable and comfortable at slow speed with great standover clearance for stop and go riding conditions. Both frame and fork are anodized to cut weight and buff durability. Complete, it gets Surly Holy Rolling Darryl rims, and a combination of 11-36T SRAM cassette with SRAM group and 22/36t e*thirteen crankset. For the frameset pricing is $999. Complete it’s $2,999. Geometry and images after the break. On top of Beargrease, Salsa is dropping four more bikes – the Colossal disc brake road bike, the Vaya Travel stainless steel S&S coupled touring bike, the Warbird gravel racing bike and a limited edition single speed El Mariachi 29er. Also, they’ve incorporated alternator dropouts on their entire El Mariachi 29er line and Mukluk snowbikes to allow for an easy switch between gears and single speed. Summer Streets is an annual celebration of New York City’s most valuable public space—our streets. On three consecutive Saturdays in the summer, nearly seven miles of NYC’s streets are opened for people to play, walk, bike, and breathe. Summer Streets provides more space for healthy recreation and encourages New Yorkers to use more sustainable forms of transportation. Summer Streets is modeled on other events from around the world including Ciclovía in Bogotá, Colombia and the Paris Plage. The event is part bike tour, part walking tour, part block party--a great time for exercise, people watching, or just enjoying summer mornings. 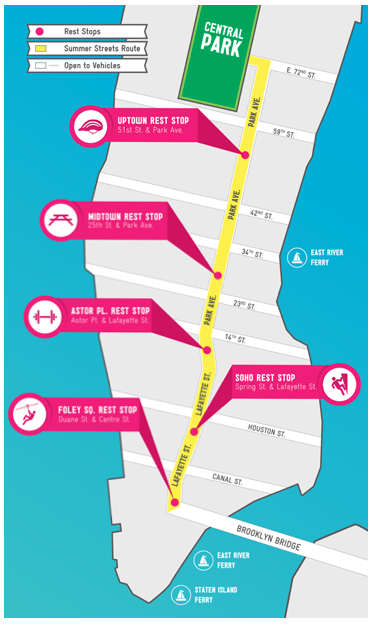 Summer Streets runs from 7:00 am to 1:00 pm. The route extends from the Brooklyn Bridge to Central Park, along Park Avenue and connecting streets, with easy side travel options on low-traffic streets to the Hudson River Greenway, Harlem, Brooklyn and Governors Island, allowing participants to plan a route as long or short as they wish. All activities at Summer Streets are free of charge, and designed for people of all ages and ability levels to share the streets respectfully. Summer Streets is a project of the New York City Department of Transportation. DOT is joined by several other City agencies and the Mayor’s Fund to Advance New York City to present Summer Streets. ATHENS, Ohio - The Ohio University Police Department said vandals caused $10,000 worth of damage along a bike path near campus. Police said the vandals damaged ten light poles between 9 a.m. Friday, July 20 and 8:45 a.m. Saturday, July 21. The Athens County Crime Solvers Anonymous is offering a $2,000 reward for information that leads to the arrest of the person or persons responsible. Anyone with information is asked to call 740-594-3331. Walkway Over the Hudson State Historic Park is a linear walkway spanning the Hudson River. At 212 feet tall and 1.28 miles long, it is the longest, elevated pedestrian bridge in the world. The park is managed and maintained by NYS Parks – Taconic Region. Walkway State Park officially opened to the public on Saturday, October 3, 2009. Walkway State Park is open year-round, weather conditions permitting (closed in the event of lighting or ice). Take an online Virtual Tour! Office hours 8:00 a.m. – 4:30 p.m. There are handicap designated parking spaces available on both ends of the bridge. The Walkway is wheelchair accessible and motorized scooters or other power-assisted mobility devices are allowed (for the handicapped only). There are no equipment rentals on site. No skateboards, ripstiks or motorized vehicles are allowed. There are picnic tables at both bridge approaches. There are benches at each of the bridge's three scenic overlooks. Rest rooms are available at either end of the bridge. Bike racks are available at both bridge approaches. Food and Beverage Concessionaires are also available at both approaches. The park offers interpretive signs at the bridge’s approach as well as along the railings. Select interpretive signs are linked to a free cell phone tour called, Talkway Over the Walkway. This is a smoke and alcohol free park. Household pets only; must be on a leash not more that 6 feet long. Here are your High St. sharrows - right in the door zone. Thanks, Columbus! Yay Bikes! will be in attendance. We oppose the plan because we believe that it will slow bus traffic, cause cyclists to ride unsafely in the door zone and attract more motor vehicle traffic to downtown. Much has been made of Columbus’ efforts to become a more bike-progressive city, and the health and financial benefits of cycling have become the core rallying cry of many a community initiative. With the rise of Pelotonia and the city’s 2 by 2012 campaign, there are more two-wheeled vehicles on our flat, friendly streets than ever. With so many ways to bike around Columbus, why aren’t more people involved? That is one of the issues Meredith Joy tackles as Executive Director of the biking advocacy group Yay Bikes. There have been a number of laundry-based innovations featured on Springwise in the past few years, including ones with a charitable slant such as the Tide Loads of Hope campaign and the Method donate and wash truck. Hoping to make a real change in poorer areas is the GiraDora, a portable pedal-powered washing machine produced at an affordable price. 1. noun. One who promotes the activity of cycling for transportation, sport, health or recreation and invests in or encourages public investment in cycling infrastructure and commerce. 2. adj. The quality of applying the technology or culture of cycling to acquire wealth or increase individual and societal well-being. Etymology: from the French velocipede, a term literally meaning “fast foot” applied to precursors of modern bicycles and English capitalist, meaning one who acquires, employs or deals in capital goods, financial instruments or other valuable assets. A bus driver arrested after a cyclist was fatally injured near the Olympic Park in East London has been released on bail. The Metropolitan Police confirmed that the driver, in his mid-60s, had been released following his arrest on suspicion of causing death by dangerous driving. The 28-year-old cyclist was struck by an official Olympic bus in Hackney at around 7.40pm on Wednesday and died at the scene. The London Ambulance Service spokeswoman said: "Sadly one person was pronounced dead at the scene by the air ambulance doctor." A London 2012 spokesman said: "We can confirm that a cyclist tragically died as a result of a collision with a bus carrying media from the Olympic Park. "The police are investigating the accident and our thoughts are with the cyclist's family." The collision is being investigated by the Metropolitan Police's Traffic Investigation Unit. Speaking at a news conference shortly after the incident, Britain's cycling gold medallist Bradley Wiggins called for safety helmets to be made compulsory. He said: "It's dangerous and London is a busy city and a lot of traffic. I think we have to help ourselves sometimes. "Cycling is a dangerous sport. I know there are a lot of people out there who ride bikes who abide by everything, the laws, the lights and things. "But there are a lot of cyclists as well who don't help themselves, riding along with no helmets on, iPods on, this, that and the other on those Bojo things. "There have got to be laws that protect both parties. Things like legalising helmets, making them the law to wear. They shouldn't be riding along with phones and iPods on, shouldn't be riding without lights." But despite the Olympic and Tour de France champion's comments, London Mayor Boris Johnson said there were no plans to make safety helmets compulsory. "We have absolutely no plans to make them mandatory," Mr Johnson said. "The evidence is mixed. I have to say, that in countries where they have made them compulsory, it hasn’t always necessarily been good for cycling." Remember when we used to sit inside cardboard boxes as kids, and pretend they were planes, trains or automobiles? Israeli designer (and cycling enthusiast) Izhar Gafni takes that whimsical idea one step further by making a bicycle almost entirely out of cardboard — and riding it through the streets! The upcycled invention (made mostly of cardboard, with real tires and brakes) can support up to 300 pounds and pedals like a regular bike. Gafni was able to create the sturdy structure by bending, folding, and gluing multiple layers of cardboard together (testing their strength under the weight of cars! ), then dipping the components in resin for waterproofness. Bike Fancy, when I started out writing it (a mere three months ago), seemed deceptively easy. Based loosely on Chicago's Bike Fancy Blog and modified to feature local 'Busites and the bikes they love; I thought I had my leave-a-note-send-an-email-meet-for-photos routine DOWN. Oddly enough, some people just aren't that cooperative. Not that I'm thinking their incommunicado ways are malicious. No, maybe they just don't want attention. Maybe my email was delivered to their spam box. Maybe my calling card blew away into the wind. The very first guy I photographed for Bike Fancy I met at a local bar in mid-March, as my man-friend and I were circling the front for a place to lock our steeds. "Lock it to the gate, that's where everybody locks it,"
a forty-something goateed man called from the patio, cigarette pinched between his fingers. Dude then hippie-wandered (you know, that slow and careless amble) out from the patio and proceeded to happily and proudly show us his dark green 1970s road bike. Turns out he books the bands for this particular bar and rides to work daily. I snapped several photos and we exchanged emails. Later, my emails to this gentleman go unanswered. I'm thinking "spambox," so I look him up easily on Facebook. Hilariously enough, my Facebook Mobile froze as I hit "Add Friend" and I end up friending about 15 people with the same exact name. I didn't realize this until I received 15 confirmations of friendship throughout the next few weeks. None of the confirms are my Bike Fancy. 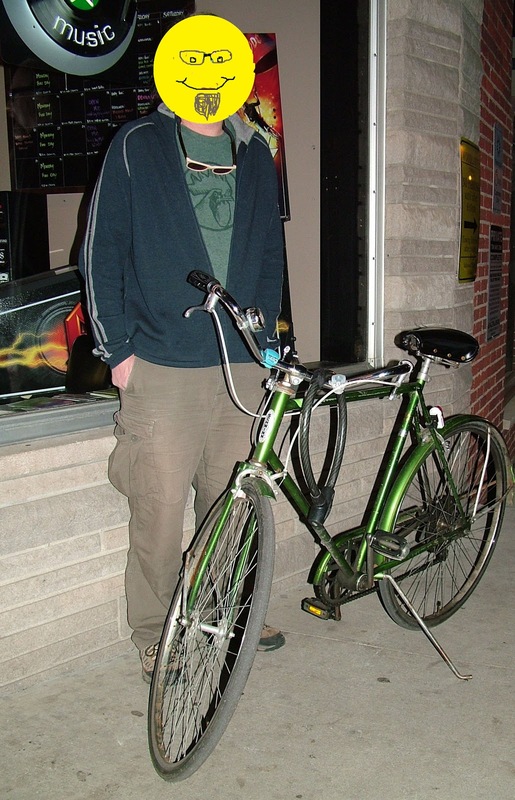 Here is a photo of my first Bike Fancy subject. My weak Photoshop skills have been applied to make him anonymous, since I never received permission to use his image. At the end of May I noticed an old silver Ross in clean condition parked every day at the Columbus State bike racks. What drew me to this particular bike is that there's one of those huge golf umbrellas secured to the frame. The kind that are about three feet long. How does this work? I wonder if the rider uses the umbrella as he or she is riding. I slipped the calling card onto the handlebars. A few days later I received a reply that isn't as much as a "yes, I'd like to be interviewed" but a "Please don't bother me." Phrases like "I may be selling the bike soon," "I don't know much about internet stuff," and "I'm generally a private person" are contained in said email. But Eugene (Yep, Eugene. Perfect name for an old man carrying a huge umbrella on his vintage bike, I think) also stated that he wants to be interviewed. I respond with my availability for the following week. Eugene says, "I will meet you tomorrow at 3pm!" I reply, "I'm not available at 3pm tomorrow, but maybe we could meet next week, any day after 4pm?" Eugene: "I'll be waiting for you at 3pm outside of the computer lab this Thursday!" After several back and forths, one of us gives up. I think it was him. I'm stubborn. Other Bike Fancies besides the two stories above have been severed before they were truly created. There's the long-haired biker-looking dude on a well-decorated, lit-up cruiser featuring ape-hangers, I actually jumped a bar patio fence and chased him down for his contact information. Then there was this bike. 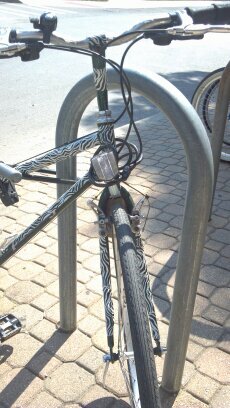 What appealed to me was the fact that the entirety of it is wrapped in zebra-striped duct tape. What kind of paint job is this bike hiding? I wish the zebra stripes were fuzzy. 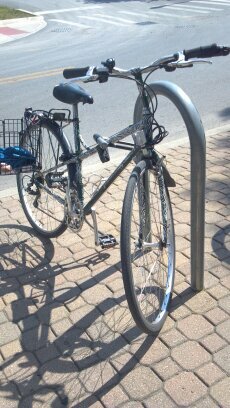 This bike was parked in the same place on OSU's campus, every day for several quarters. After I left my calling card, it disappeared for a month. It reappeared this week. The folks I have successfully reached and interviewed for Bike Fancy have been awesome, and excited to talk about their bikes. That's the great thing about bikes, it's really hard to not get excited about them. So, I will continue to leave my calling card, and surely continue to be "stood-up," so to speak. But for every other responseless cyclist, there's somebody who will talk to me at length about how much they love their bike. p.s. In my head I'm singing "Bike Fancy willl go aah-onnn" to the tune of Celine Dion song right now. Really. Lots happening these next few weeks in YB!-land! Take special note of two rides - Year of Yay 8 (Aug 18) is a tour of urban gardens that we're offering in partnership with Local Matters, and Bike the Cbus(Sept 1) is back for its 5th year. Other events include Sell Ur Bike Stuff (SUBS) on Aug 19 at Franklinton Cycleworks and and a new Riverfront Arts Festival Ride on Sept 29. And be sure to join us for eats at the Jury Room on Sept 24, as they'll be donating 10% of food sales that day to YB!. In other organizational news, we have some exciting How We Roll updates and it's an especially good time to become a member! 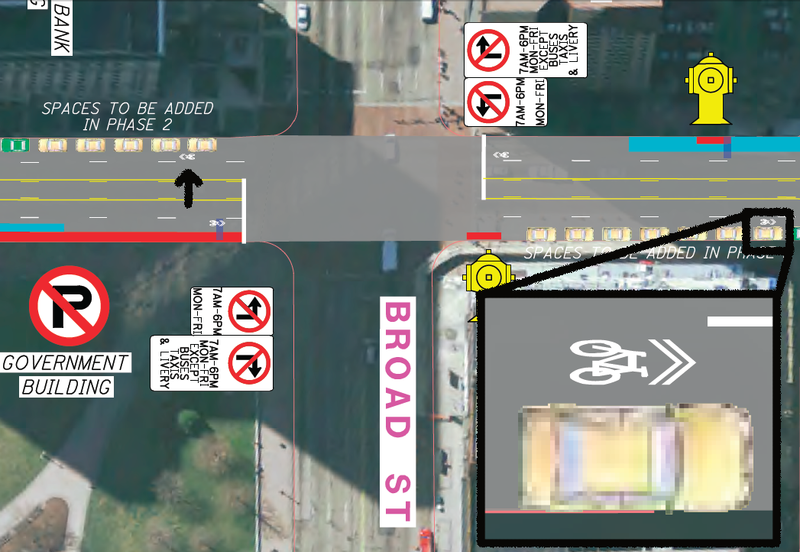 And finally, Pedal Instead has a sweet new sponsorship that puts free Chipotle in your belly and there's a public meeting tomorrowregarding the new Columbus proposal to add 130 on-street parking spots along High Street from Nationwide to Mound. Hope to hear from you soon, and to see you out on the road! AUG 18 -- Tour of Urban Gardens -- Register Now! 5th Annual Bike the Cbus -- Register now! We're closing in our our 200th Founding Member! And that lucky member will receive a package of gifts worth $200, so JOIN TODAY to see if you're the one! We're back at OSU, expanding to Akron, seeking sponsors and offering all types of educational bicycle tours. Learn more about these exciting new initiatives and read our final report from last fall's OSU pilothere! Pedal Instead, a project of our partner The Enrichment Association, has a sweet new Chipotle sponsorship that directly benefits YOU, when you volunteer to park bikes or ride your bike to an event during 2012. Volunteers who take 4-hour shifts will receive a FREE Chipotle burrito, and EVERYONE who bikes to an event will receive a Buy-One-Get-One coupon! Check the website to see what volunteer shifts are available and what events are offering Pedal Instead. P.S. LIKE US ON FACEBOOK!